Think graham cracker cupcakes. Nutella frosting. Toasted marshmallow meringue. A perfect twist on a classic s’more for your Fourth of July celebration. 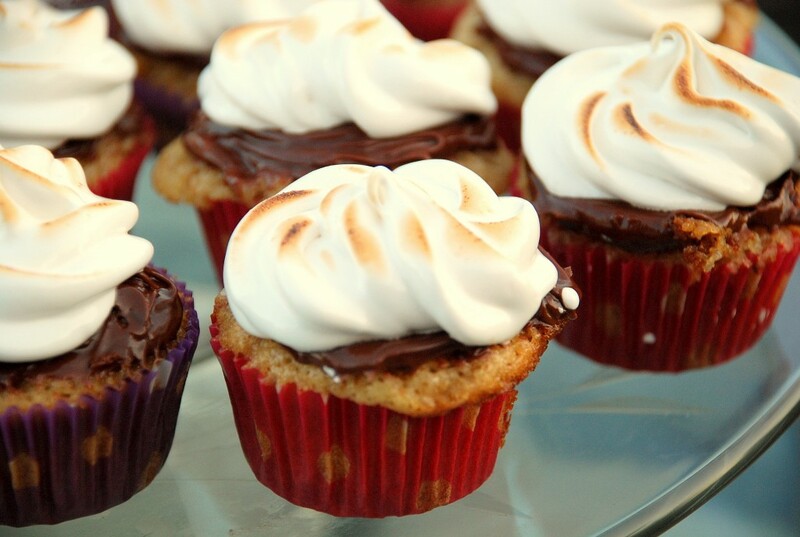 A s’more in cupcake form? Yes you can. I made mini-cupcakes because I think it gives the perfect “one-bite” of graham, Nutella and toasted marshmallow. To toast the marshmallow frosting I just used a butane stick lighter (must be butane) — the same one I use to light our grill. If you have a fancy kitchen torch, even better. Or follow instructions for placing under your broiler below. Happy 4th of July y’all! We’ll be right here on The Range cookin’ for our friends. Where will YOU be? Preheat oven to 350. Place cupcake liners in muffin or mini-muffin pan. Beat the butter for about 30 seconds until well creamed. Add the sugar and mix for 3 minutes until light and fluffy. Add the eggs, one at a time, being sure to beat for 30 seconds for each egg. Place graham crackers in a food processor or in a plastic bag and beat the crud out of them until it's been ground into small crumbs and powder. Sift together the flour, graham cracker crumbs, baking soda and powder, and salt. (Note: If you are like me and glaze over when someone says "sift" -- and then talk yourself into skipping it because it's too much work -- DON'T. Graham is a pesky little dry good and it really does need to be sifted w/ the flour for the best texture.) Add about 1/4 of the mixture to the butter mixture, then add some of the milk. Continue to add the ingrdients in dry-wet-dry method, ending with the dry. Continue to mix until just combined. Scoop into cupcake papers and bake for 15-18 minutes (regular sized cupcakes) or 12-15 minutes (mini cupcakes) in a 350 F oven or until a cake tester comes out clean. 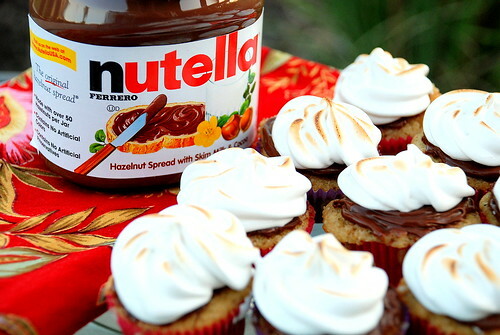 When cupcakes have cooled, spread tops with Nutella. To make the toasted marshmallow frosting, whisk together egg whites, sugar and corn syrup in a heat-proof bowl placed over a saucepan with barely simmering water. Whisk continuously for about 6-7 minutes, or until egg mixture is warm and sugar is dissolved. Add egg mixture to a large mixing bowl and add vanilla and salt. Mix, using a mixer on high speed, for about 7-9 minutes or until egg mixture is whipped, fluffy, and stiff.